I hope you had a ghostly, ghoulish, apple-bobbin’ Halloween! With the trick or treating behind us, Thanksgiving can’t be far away; I wish you a safe and happy one. This month, I address a question that always seems to be on the lips of prospective video biographers. Fire up your computer, launch your browser, and zoom over to B&H Photo & Video. Once there, check out the professional video camera offerings. As you’ll see, there’s quite a selection, featuring a wide range of price points. If you really have your heart set on buying a camera, decide how much you want to spend and zero in on offerings within your range. I advise focusing on models from Canon, Panasonic and Sony. These companies have been creating reliable cameras for years. Once you’ve narrowed your choices, be a savvy shopper and read reviews, visit user forums and do your research. A professional video camera is a substantial investment and you want to make sure you choose well. Some more food for thought: Be aware that you’ll need more than just a camera. You may need an extra lens or lenses, you’ll certainly need extra batteries, a tripod, a field monitor, electric, audio and video cables, microphones, lights and assorted lighting gear and cases or bags to carry it all in. Sounds expensive and a bit intimidating, I know. But another point I want to make here is this: You don’t have to buy everything – or anything, for that matter, if you don’t want to. 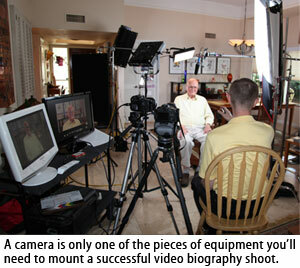 In just about every market you’ll find video production companies or guys-with-cameras-for-hire. You pay them by the day, they bring all the gear, set it up, run it while you conduct the interview, give you the video and audio files, pack it all up and haul it all away. No fuss, no muss. Just make sure you check out samples of interviews shot by the people or companies you consider to make sure they know how to light, compose a shot and deliver good sound. Now, if you’ve really got your heart set on owning your own gear but are having a hard time settling on a particular camera, try renting. If you’re in a decently-sized metro area, you may have access to a rental house offering a variety of cameras, lighting and audio gear. Rentals by the day are usually pretty reasonable, and many of these companies offer discounts if you rent by the week. Renting gives you a chance to try out a variety of cameras before you commit to buying. Oh, and while this should go without saying I’ll say it anyway: Learn your craft. There’s both a technical and an artistic side to shooting video. If you have no experience, look for digital video classes at your local university or community college. Learn the basics before you start shelling out a lot of your hard-earned cash for gear. One final note: Good luck! It’s holiday gift certificate time! If you’d like to give the gift of a video biography this holiday season and you’re wondering if there’s enough time to start and complete one by Christmas or Hanukkah, the answer is…no. BUT, if you book a legacy video before the holidays, we’ll be happy to provide you with a gift certificate featuring a personal message from you to your storyteller. Please phone or e-mail Family Legacy Video, Inc. for more details.